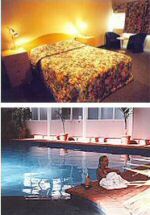 Ciloms Airport Lodge is the Melbourne airport hotel motel !!!! This affordable Airport hotel accommodation is conveniently located only two minutes drive from the Airport in Melbourne and provides all the comforts and conveniences you would expect from a quality hotel and much, much more. The dedicated staff, luxurious accomodation (which comprise beautifully appointed suites), and exceptional A La Carte Restaurant will ensure that you have a pleasant and memorable stay. For your convenience, Ciloms hotels Melbourne airport offers a 24 hours Reception Desk, Room Service and Courtesy Bus to and from the airport in Melbourne. BOOK ONLINE AND SAVE !! !